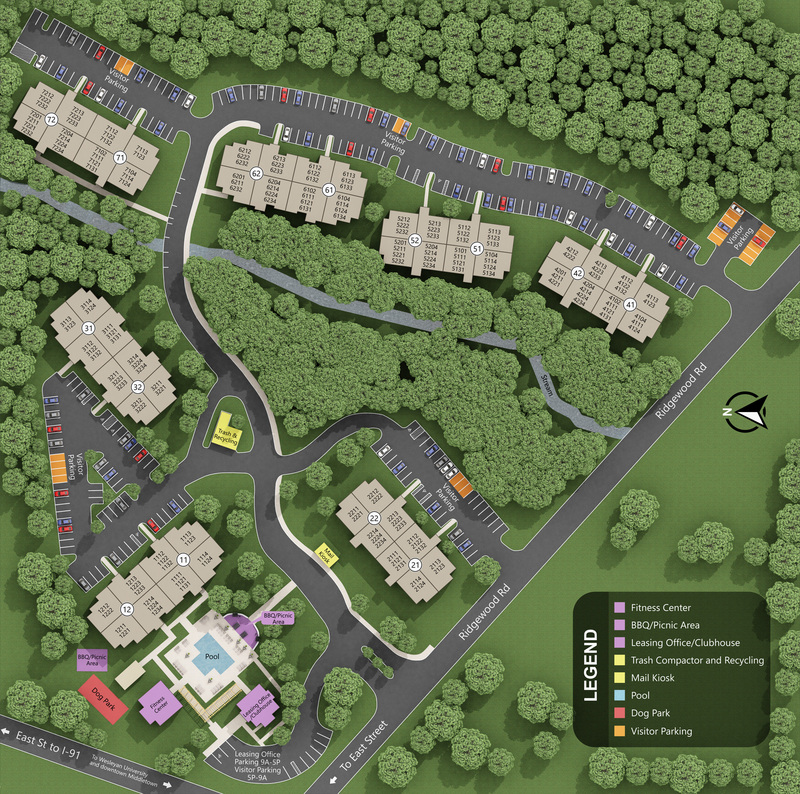 Each 2D Realistic Site Map is designed with a unique 3D look and feel to represent your property and highlight amenities. Unlimited rounds of changes until approval. Final files include JPG for web and PDF for print. 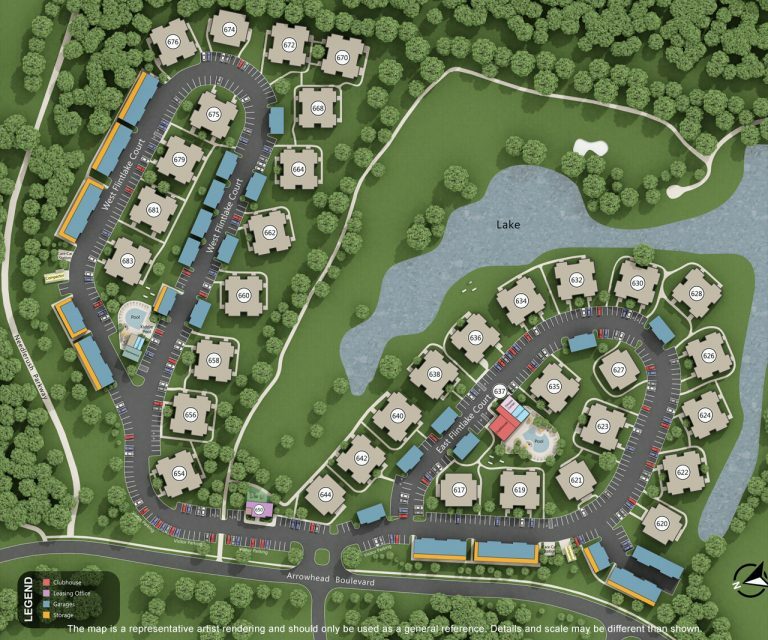 A 2D Realistic Site Map is a map of a multi-family property used to highlight amenities, guide residents and prospects, and showcase the property. Although a 2D product, it has a 3D look and feel. A colored site map of your property designed from your existing map or satellite photography including roads, amenities, parking, and building locations and numbers. 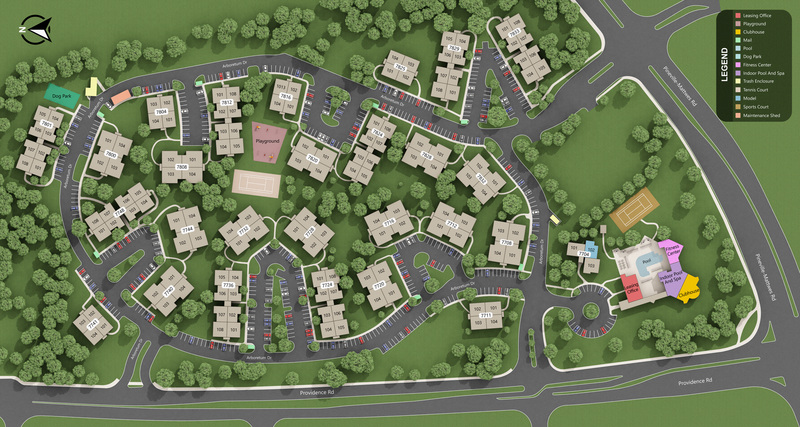 Amenities visually highlighted such as your clubhouse, pool, dog park, tennis court, gazebo, playground, office and more. 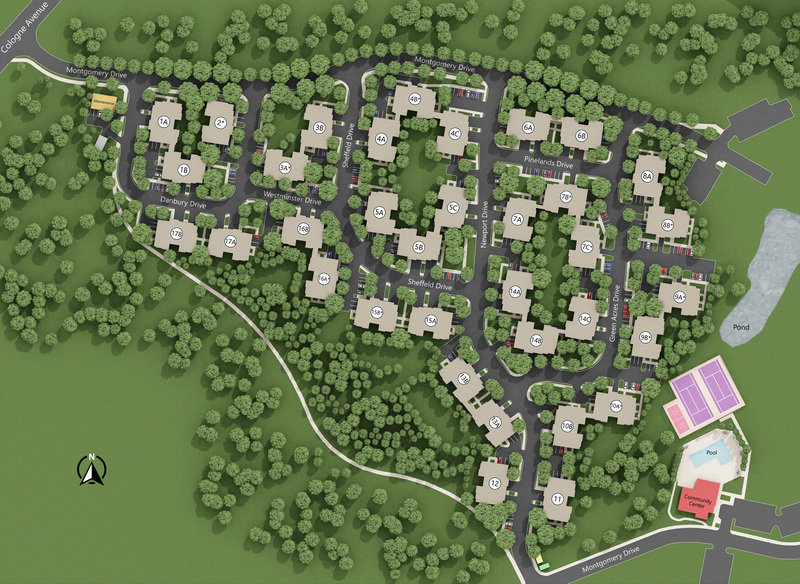 Attractive design details including vehicles, North compass, trees, walking paths and water features. Christine and the design team were fabulous! We had a huge project and it took a Herculean effort to get this done. Not only did they do it but everything turned out perfectly! Kate has been impressively responsive and informative throughout the entire process. It has been a pleasure to work with her & her team. Building numbers are added to identify each building on your property if supplied. 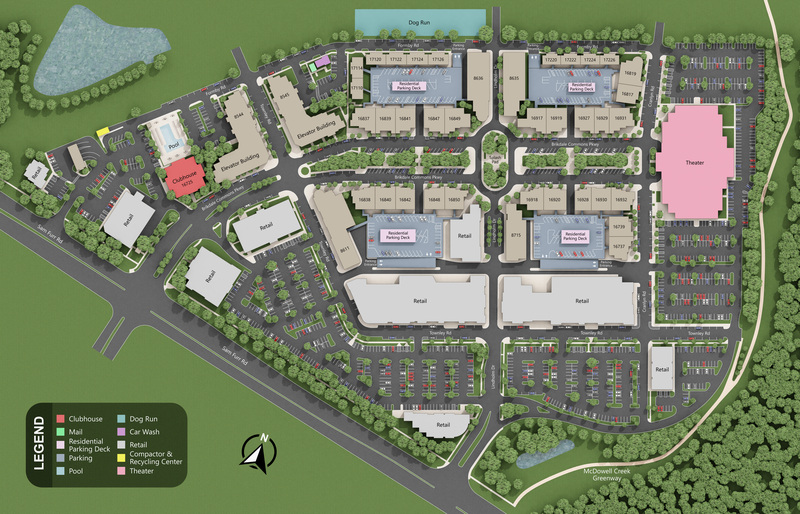 Sidewalks, parking spaces, vehicles, North compass, trees, and water features are highlighted. 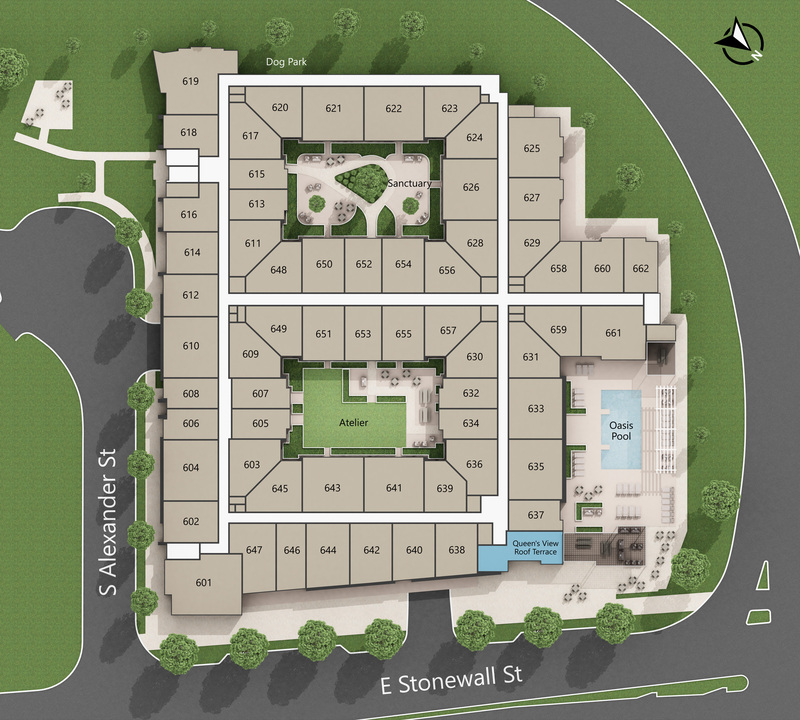 A key details amenities such as your clubhouse and fitness center. Request changes to your 2D Realistic Site Map until you approve. 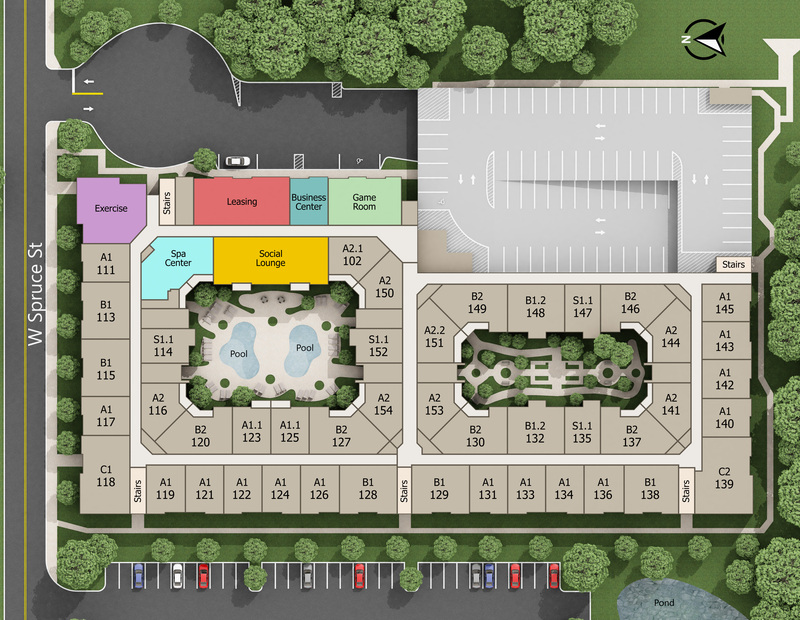 Unit numbers can be added into your 2D Realistic Site Map for an additional cost. Multiple levels or different versions can be created of your 2D Realistic Site Map for an additional cost. A poster resolution image can be supplied upon approval of your project for no additional cost. Count the number of residential buildings to determine the price. 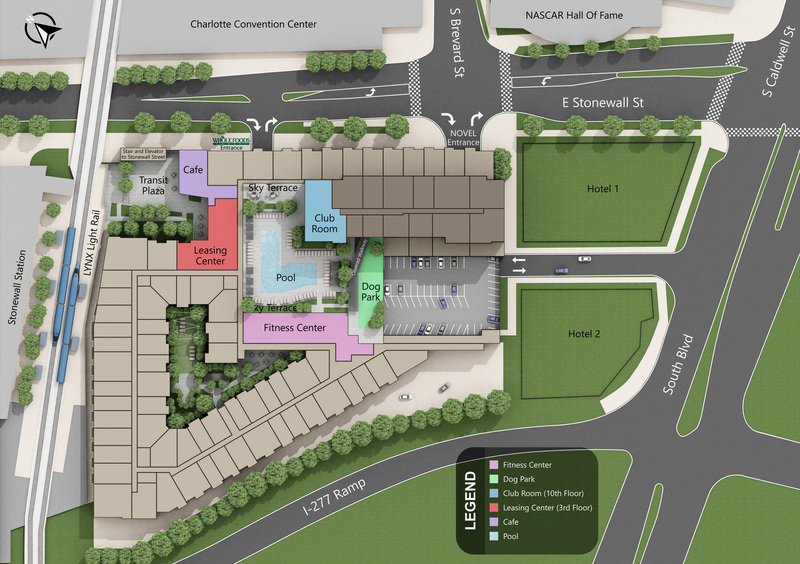 Do not include amenities, garages or off-site buildings. 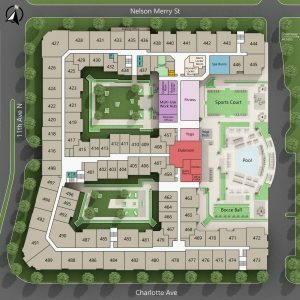 Can I print my 2D Realistic Site Map onto a poster? Yes, a poster resolution file can be supplied for no additional cost. 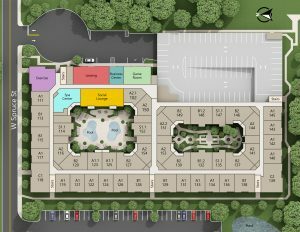 The shape of each property is different and the size of your poster may need to be adapted to fit the width and height of your specific site map. How are multiple levels shown? Multiple levels can be shown on a single image or multiple images. On a single image, the map can show unit numbers side by side. On multiple images, each image can show a different level of the map. 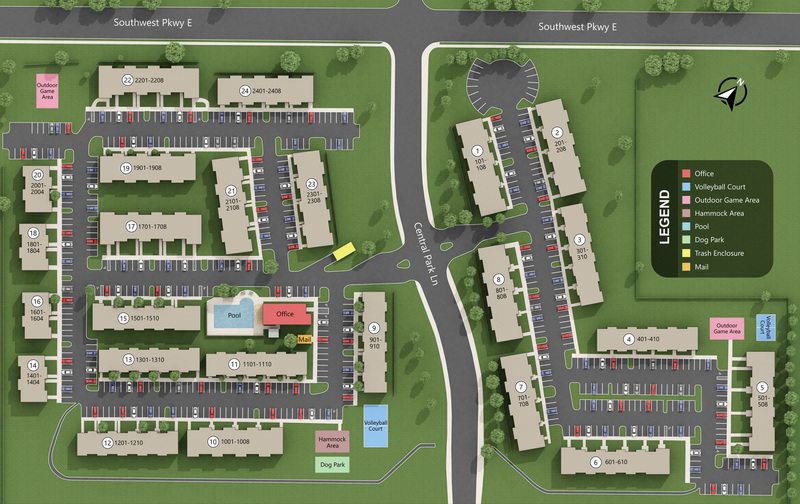 What is the difference between a 2D Realistic and 2D Basic Site Map? Both are similar. 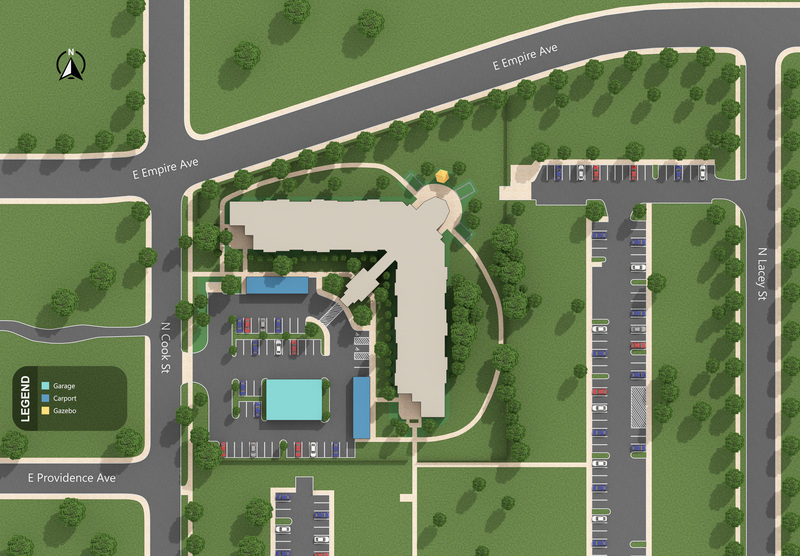 The primary difference: The 2D Realistic Site Map is designed in a 3D application, which allows for a more realistic look and feel although it is shown in 2D. The 2D Basic Site Map is designed in vector format, which allows for infinite zoom and a unique 2D look. 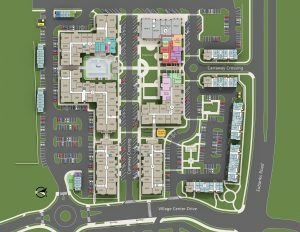 What is the difference between a Site Map and a Building Map? A Site Map is focused on the entire property and its exterior details. 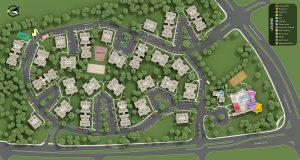 It showcases details such as the location of buildings and amenities, parking spaces, road names, and other exterior details. While basic interior building details can be added, the site map is primarily focused on the property’s exterior. A Building Map is focused on an individual building, its various levels, and interior details. 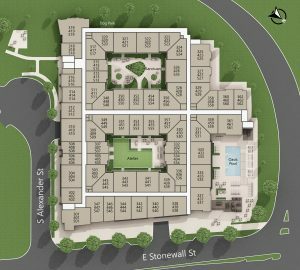 It showcases details such as interior outlines of each building, interior amenities, specific rooms, stairs, elevators, and so on. While basic exterior details can be added, the building map is almost entirely focused on interior details. Unit numbers can be included for an additional cost. Building numbers are included at no cost. Yes, a generic key/legend is included for each site map. It can be removed and the amenities highlighted on the map itself if requested. 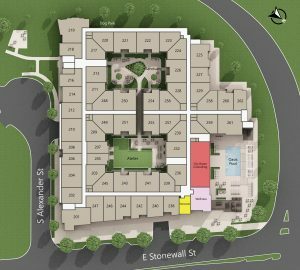 Can I order a 3D Site Map? 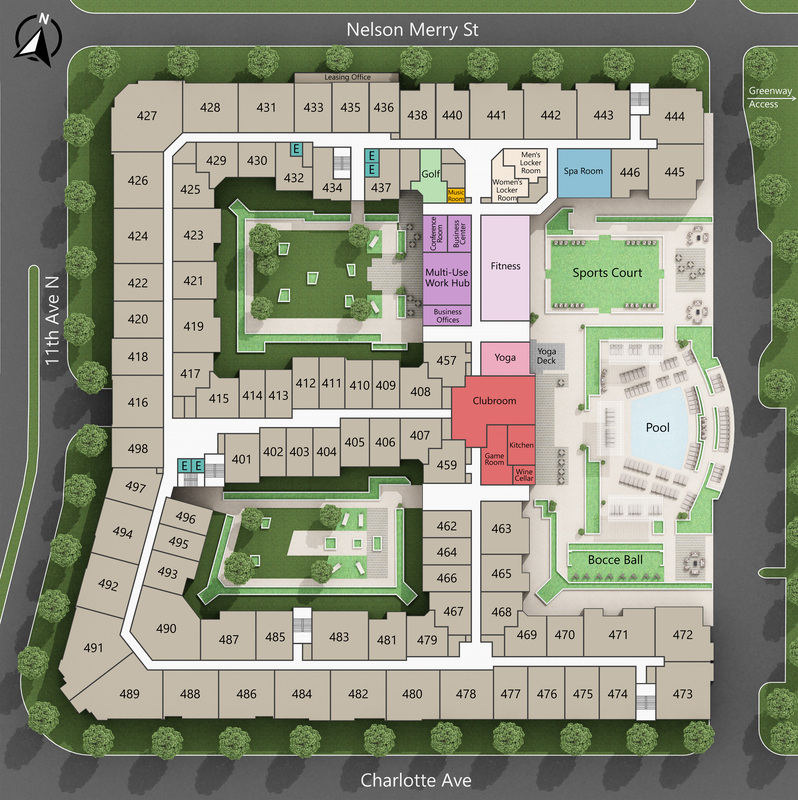 Unfortunately, we do not design 3D site maps. 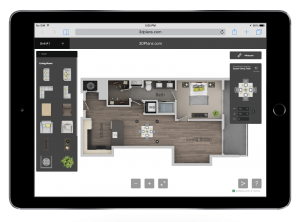 However, a 2D Realistic Site Map gives the look and feel of a 3D site map, but is not technically a 3D product like our 3D Floor Plans. What files will I receive when the 2D Realistic Site Map is finished? Each 2D Realistic Site Map includes both a JPG and 4K PDF. Examples can be downloaded here.